As birds age, a decrease in physical activities is usually observed as energy levels go down. Also conditions like arthritis may make certain movements uncomfortable / painful. Look out for limping. Senior birds may become more sedate and easy-going. Although some owners describe their pets to be as feisty in old age as they were when they were younger. Toys: Older birds that have not been exposed to any variety in their lives may originally be frightened by the introduction of toys. The best way to get around this is to do a very gradual introduction. The most important thing is to not give up. These older birds will benefit from environmental enrichment just as much as the babies. 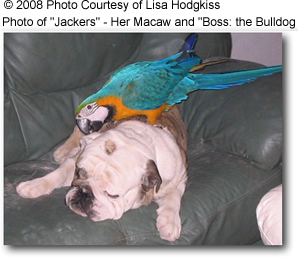 Older birds may be less tolerant of people inexperienced with parrots. Although the level of affection towards the family members remained the same. They are just less likely to want to be with people they don't know. Older birds have been observed to adjust surprisingly easy to new home: Rehoming organizations found that older birds placed into new homes adjust surprisingly easily and rather quickly to their new homes and new family. Some even state that the change in home environment was even perceived as invigorating by many senior parrots. 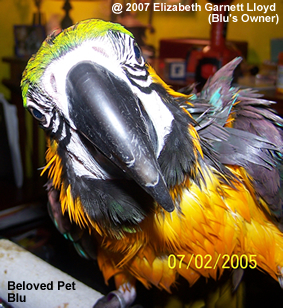 Adopting a senior parrot ... Things you should know. Birds may develop painful arthritis in their joints. This is one of the more common problems in older birds. Increased water consumption and more urine in droppings can be an indication that the kidneys aren't functioning at optimal capacity. Older birds may be more susceptible to certain bacterial, fungal, protozoal and viral infections. Older hens are more likely to develop chronic egg laying and egg binding. Tumors can be benign or malignant (cancerous) and can involve any organ or system. Some species of birds tend to develop benign fatty tumors called "Lipomas." Lipomas are commonly seen in overweight Amazon Parrot, Rose-breasted Cockatoos and Budgies. It seems that older budgies are more prone to tumors of the ovary, testicle or kidney, which may eventually put pressure on the sciatic nerve on the affected side, resulting in lameness of the foot or leg.Fibromas are tumors found on the wing and they may need to be surgically removed. In some instances, amputation of the wing may be necessary. Birds who are getting plenty of exercise (flying) are less prone to develop heart problems. However, birds who are mainly cage-bound and/or clipped can develop heart problems as they age.